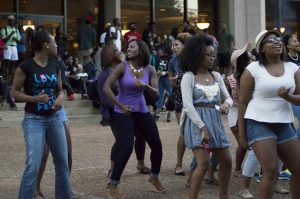 Music echoed throughout the University of Mississippi campus every Tuesday and Thursday during the fall of 2016. Synchronized claps, shouts and stomps permeated the damp Mississippi air, from the Paris-Yates Chapel to the Gertrude C. Ford Center. Blurs of vibrant pinks, reds, yellows, greens and blues captivated passersby traveling to and from class. But when students returned from break in the spring of 2017, the campus was silent — save for the perpetually reverberating hum of construction equipment. Seven out of nine nationally recognized historically black fraternities and sororities are currently represented on campus in UM’s National Pan-Hellenic Council community — Alpha Kappa Alpha, Delta Sigma Theta, Kappa Alpha Psi, Omega Psi Phi, Phi Beta Sigma, Sigma Gamma Rho and Zeta Phi Beta — and the Ole Miss Student Union, the hub of student life of campus since its creation, meant so much more to the Divine 9, as they are affectionately dubbed, than just a place to eat between classes. “It was a home, a safe haven,” said Tommy Knight, president of the Eta Beta chapter of Phi Beta Sigma. All of that changed when construction closed the student union in December 2016. 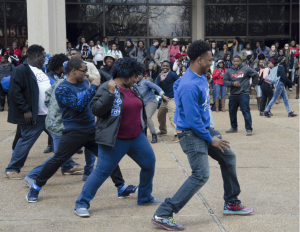 The project broke ground in 2015, but “Union Unplugged,” performances every Tuesday and Thursday at the front of the building that often included NPHC “stepping” — traditional percussive dances performed by historically black fraternities and sororities — only halted when “Phase Two” of the expansion project began. Construction on the union was initially scheduled to be completed earlier this year. It has been delayed yet again while going over its projected $60 million budget. The union is now set to open later in the semester and is “nearing completion,” according to a university press release issued on Monday. Since construction on the union put a stop to “Union Unplugged” events, NPHC members have had to find new spaces on campus, like The Pavilion. However, there is a consensus that a feeling of unity and visibility has been lost. Jarvis Benson, president of the University of Mississippi Black Student Union, isn’t a member of an NPHC organization, but he has noted that the “Unplugged” events are just not the same at The Pavilion. The lack of black spaces on campus is starkly clear when paralleled with the thick, white columns and deep red brick of Fraternity Row and Sorority Row, where decades-old mansions line the streets. Knight said the lack of black fraternity houses makes him want to work harder for equal opportunities. “It makes you envious, but at the same time, it makes you want to work,” he said. Though it doesn’t compensate, the university completed construction on an NPHC Greek Garden in the spring of 2017. It is intended to serve as a symbolic space for the campus’s NPHC organizations, but many complain that it is too small and far away to occupy. “It seemed as if (administration) tried to pacify us with the Greek Garden,” Young said. When Brian Foster, professor of sociology and Southern studies at the University of Mississippi, “crossed,” or was initiated, into Phi Beta Sigma’s Eta Beta chapter in 2009, he remembers the student union as a place where the black students of Ole Miss could build community. That’s not a coincidence, either. According to Foster, black people have had to construct their own spaces to exist throughout history, making those spaces more meaningful to the people that inhabit them. 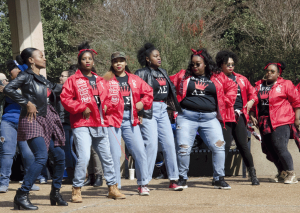 Foster believes the way the NPHC organizations on campus have adapted to the union construction, though they shouldn’t have to, speaks to their resilience. The student union is the heart of every campus, and ours used to thud with the steps and strolls of black Greeks. For the foreseeable future, though, the only beats the campus will hear will be those of construction crews.